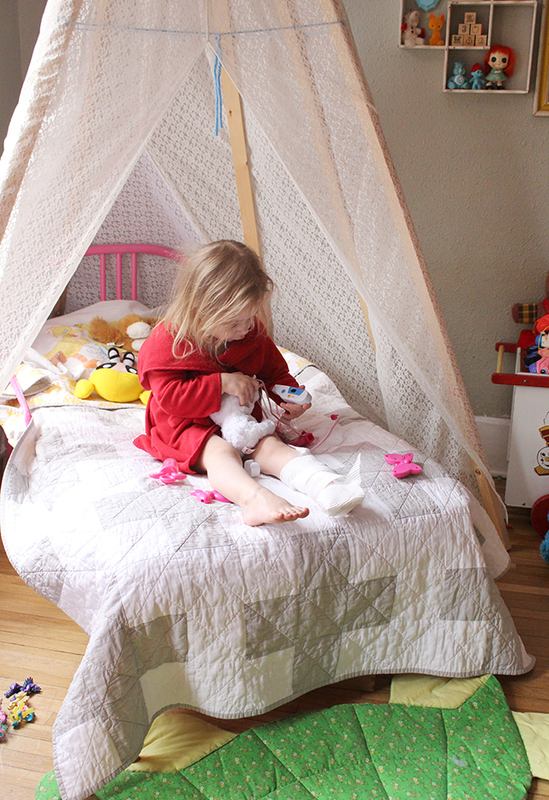 The little sock doll was what Hope made Poesy for Valentine's Day. So sweet. 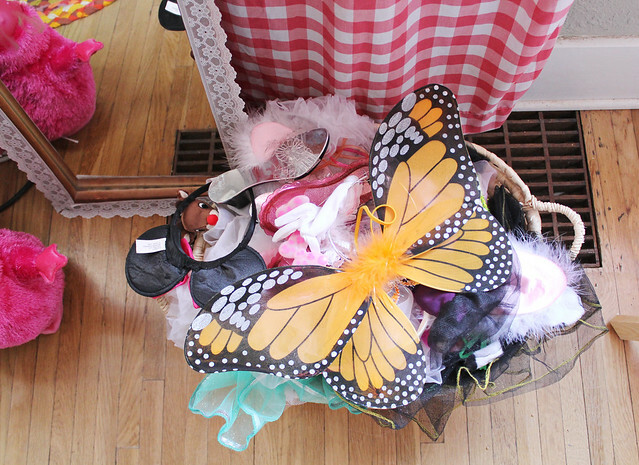 She's really into dress up right now, so a dress up basket and mirror were necessary! Here, Hope is being Poesy's doctor (she's in the hospital with a broken leg) and Poe is nursing her cat back to health. Her beautiful quilt was handmade by LWPH Sews. Such a talent, she is. I try to do a good job of rotating her toys so things stay exciting and new. The cardboard playhouse left the bedroom this round (even though it was hard for me to see that go) and the baby dolls have come back upstairs. She got the puppet theater for her birthday in January and I really wanted to put it in a place that daily shows would be encouraged. She had been asking for her little table recently, so I figured this was the perfect opportunity to subtract the trampoline (which is a complete eyesore) and put up a little table station. I tried to take the kitchenette out to stick a comfy chair in the corner, but both girls opposed. That's fine by me. I love that thing. I really appreciate that this LOOKS like a little kid's room; a little kid in 2014 to be more specific. 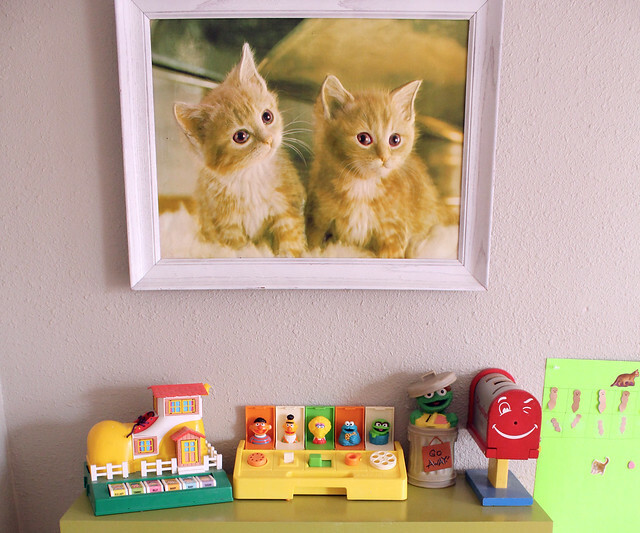 I think its great that you've found a balance between your vintage aesthetic and the bright&shiny contemporary toys. Good on you, mama! 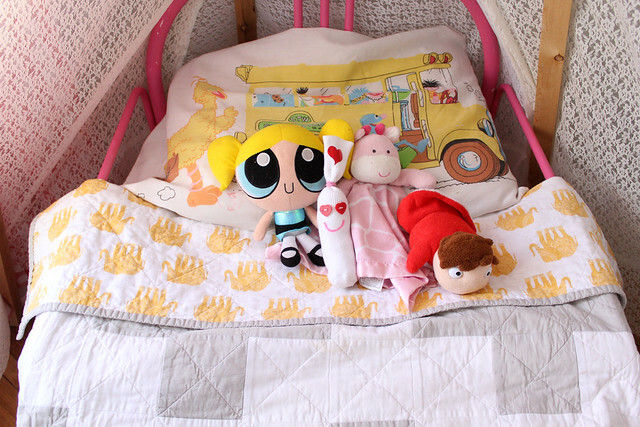 Her bedroom is adorable! I think the hardest thing with keeping kids' rooms clean is that they want to mix all of their toys together... like, instead of just playing with dolls, they'll be playing with dolls, cooking stuff, dress-up stuff, stuffed animals, random household objects, etc... and then they can never seen to put everything away in the right individual places! When I was a caregiver for my friend's kids I struggled with this every day! One trick I found was to tell them one thing at a time to put away. Like, "Let's find all the dolls and put them in this box! Okay, now let's find all of the toy food!" It seems to be easier for them than trying to contend with a giant mess all at once! 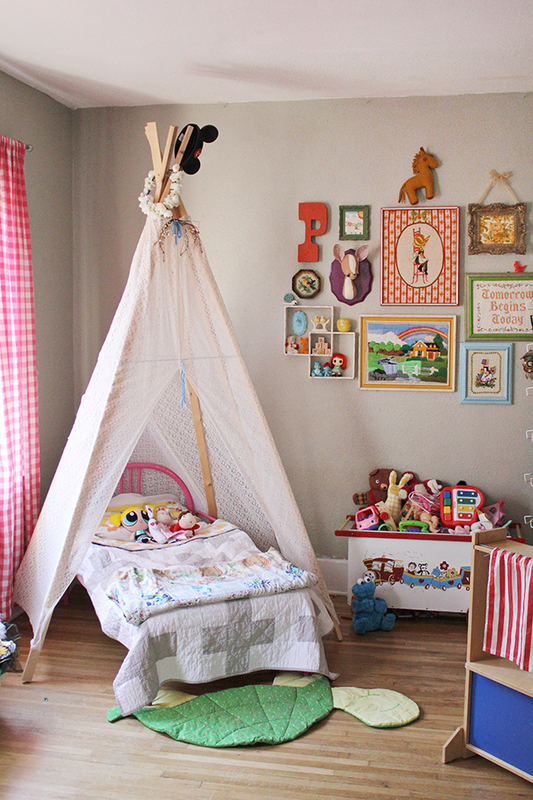 Poesy's room is lovely, I would love it if I were a kid. I like the little plush garden and all the little play areas. It's nice that she's got a mix of modern toys and handcrafted ones. Hopefully she'll keep her room a little more tidy now that she has more storage. I am so jealous of that tipi over the bed! I seriously wish I could build one for a king sized bed haha! I love poseys room so much (can I just move in?! haha)! Thank you for being honest and showing the room mid sort out. Every, single time I spend hours in my kid's room tidying, I swear it will be easier the next time. I haven't quite figured it out yet. We have a super cool massive cardboard box playhouse that was a gingerbread house at Christmas. I thought it would be trashed within a month, but it's still going strong and now I want it out of the kitchen, but just for a bit, not for good, because it's so awesome. I know!! the play garden is what caught my eye too! Her room is so pretty! She's a lucky girl to have a mother who put so much dedication into decorating her room. I can't get enough of the adorable tent! 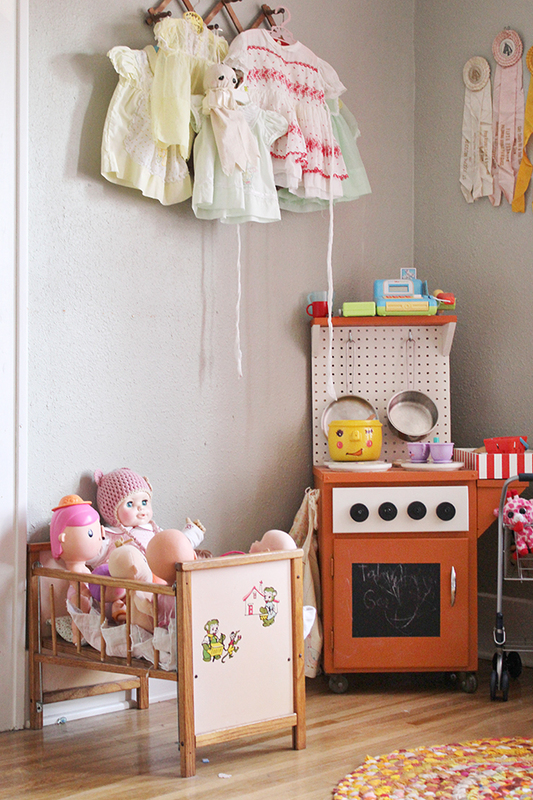 She has such a cute room and I hope she keeps it tidy now! :) I like how you rotate her toys, great idea! 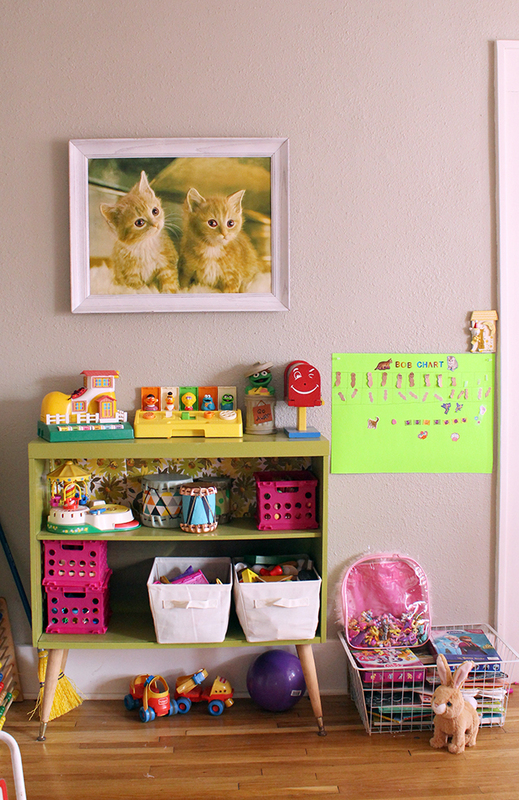 her room is so adorable and looks so bright and fun. what a lucky little girl :). Aw it's so cute how she says she will put all the toys back! what a dream bedroom for a little girl! 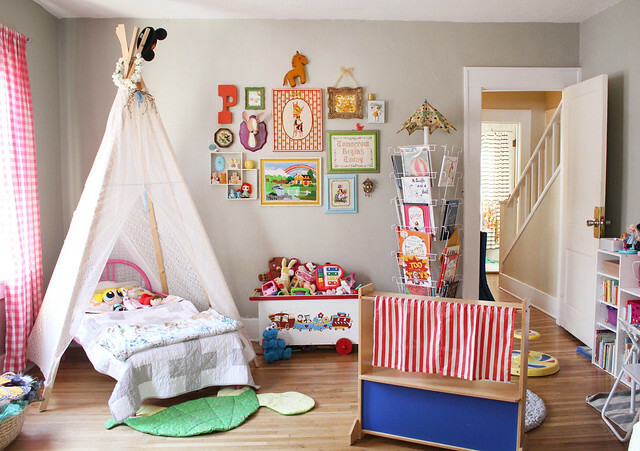 i want poesy's room, haha. and such a great job with organizing everything. i'm sure it took hours. Oh my gosh, I'm in love with the little garden box! It's so cute. I'm totally inspired to make one for my niece now. 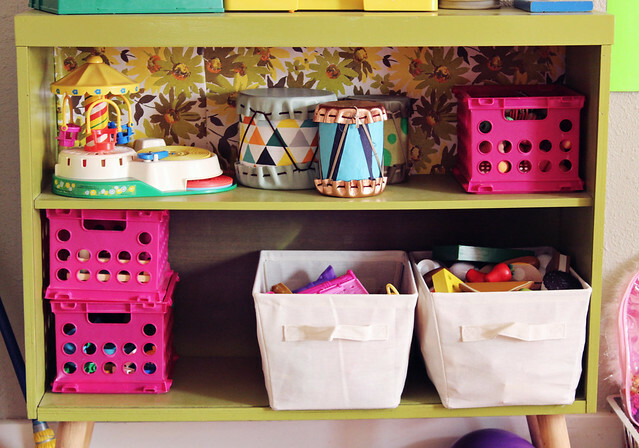 I love this last line..."Even though I may prefer a perfectly curated room with beautiful wooden toys over lots (and lots) of My Little Ponies, it's her space and I do my best to keep that in mind." So true and nice to hear from a blogger like you. For me and my not-so-little one (anymore) it was Littlest Pet Shops. Now, at 12, she's started to give them away to a friend's daughter and it's actually making me a bit sad. Thank you so much for saying that! It's hard sometimes when my girls want the plastic colorful things instead of what I would maybe have in mind, but I remember being a kid and being SO into what I was into. Holy crap! 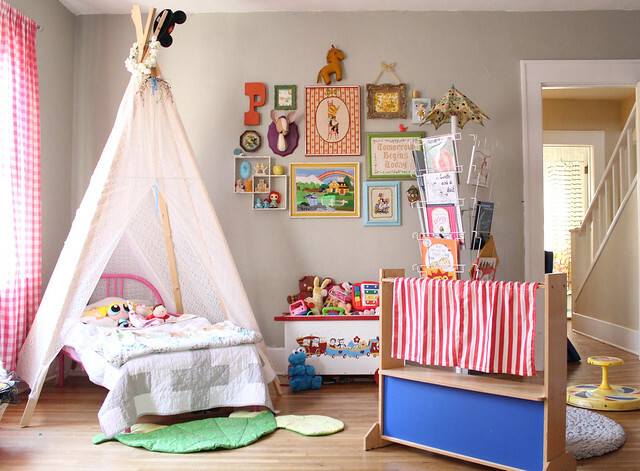 Her room is so perfect, but she looks like me as a child, she SURE can tear it up! Ah well, she will soon enough learn the importance of being clean...I'm 26 and I'm STILL learning! adorable room. 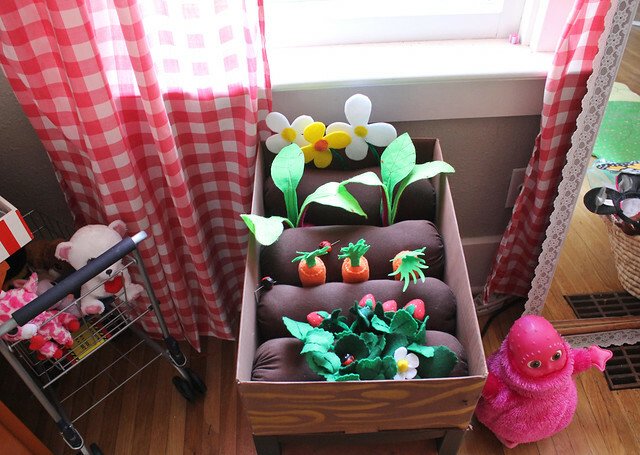 love that little plant box - did you make it? Oh my gosh- YES. I get grumpy just before any gift-giving holiday just thinking about putting all the new toys in places. 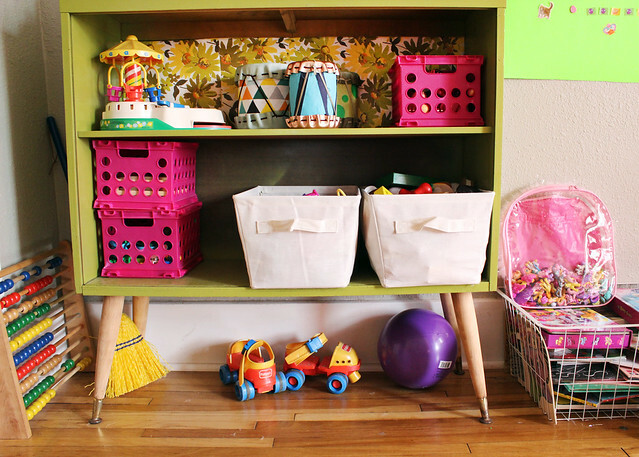 I definitely agree that kids in general have too many things, but I KNOW my kids definitely do. Part of the reason I rotate their toys periodically is to keep them interested in the things they already have. 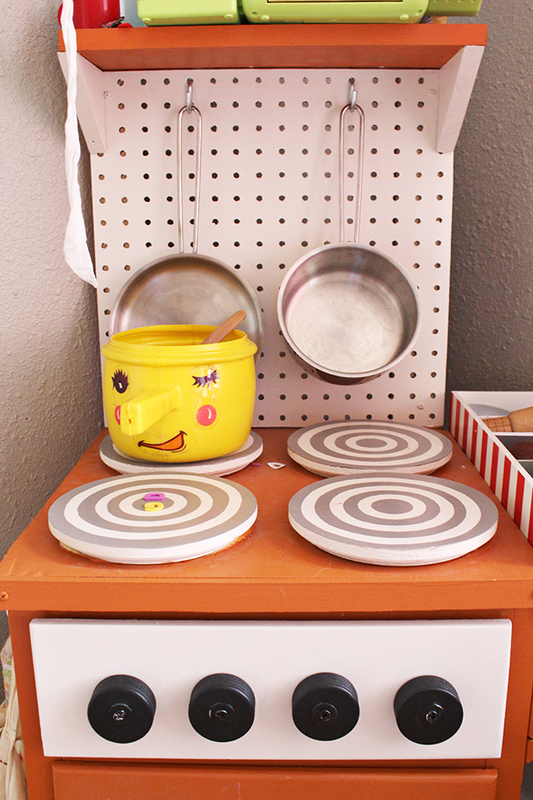 Plus, it leaves room to actually PLAY with those things when you don't have a room jam-packed with all that clutter. We are always a work in progress, but I just wanted to pop in and say that I completely agree with you! I love this room! 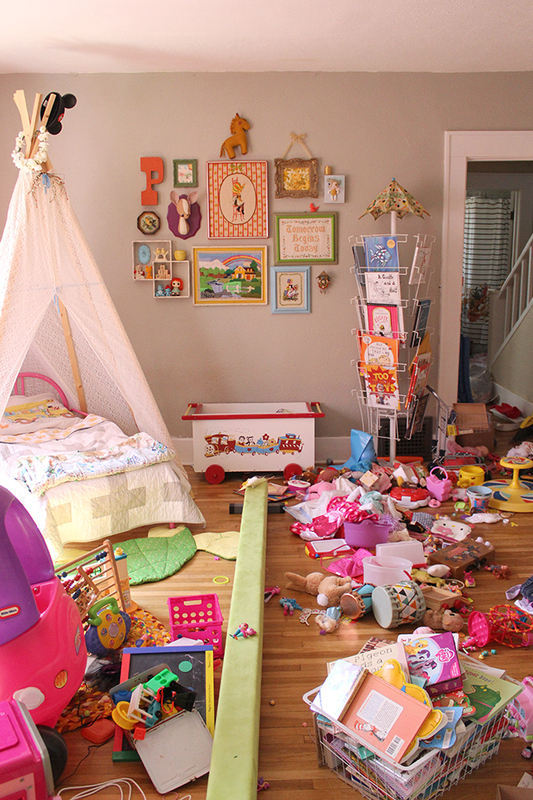 It's so hard to keep things with little kids clean, but I think you did a wonderful job organizing everything! What a wonderful space! My favorite thing is that I can easily see how much of your love you put into having such a nice area for your daughter. So sweet! 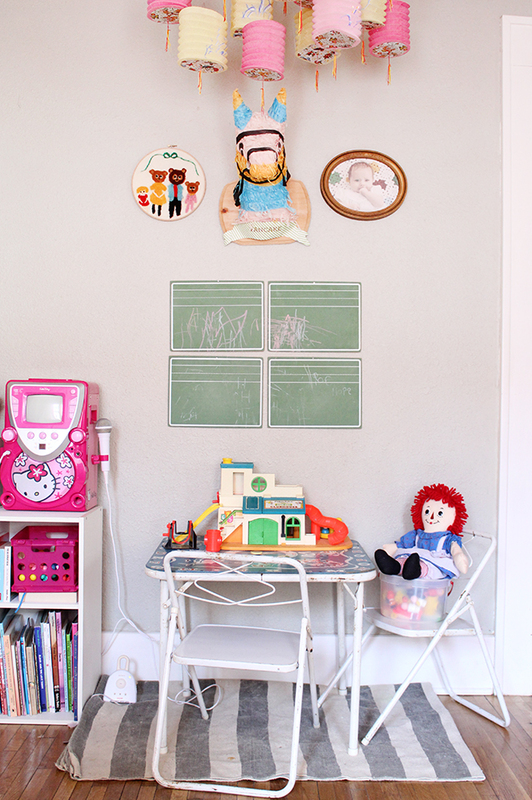 And I think you do a great job of balancing a nicely styled room with a true-to-life little girl's room. Very inspiring!